The conference will take place at McGill University in downtown Montreal. McGill University is one of Canada’s best-known institutions of higher learning and one of the leading universities in the world. With students coming to McGill from some 150 countries, our student body is the most internationally diverse of any research-intensive university in the country. McGill was founded in 1821 thanks to a generous bequest by James McGill, and since then, we’ve grown from a small college to a bustling university with two campuses, 10 faculties, some 300 programs of study, and 40,000 students. The University also partners with four affiliated teaching hospitals to graduate over 1,000 health care professionals each year. 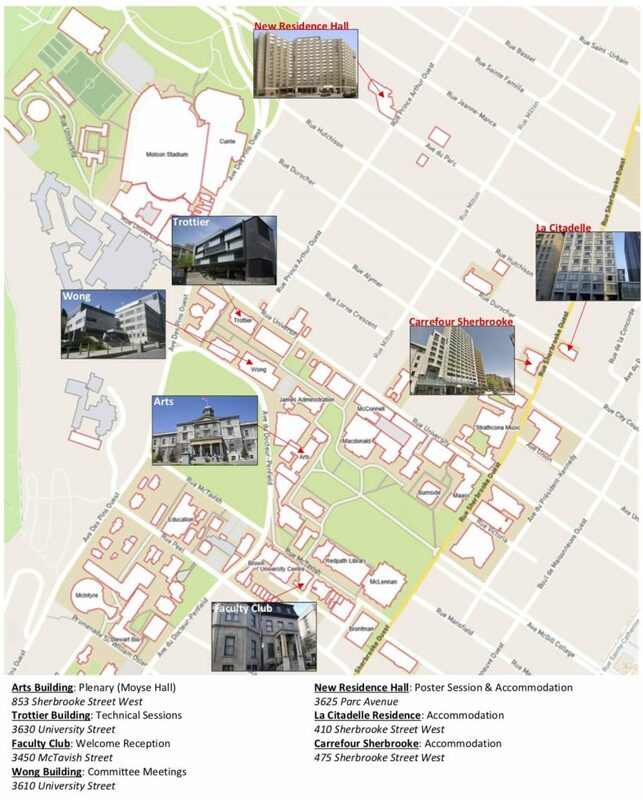 The conference activities will take place at several locations within McGill Campus. Please consult the map and save on your Smartphone! All year and every year, Montréal hosts over 40 festivals ranging from the traditional to the wildly avant-garde. Jazz, laughter, food and snow are just four of the many reasons Montrealers’ take to the streets, theatres and clubs, and party for weeks on end. Montréal is truly an experience: old world charm, French joie de vivre and a modern style allits own. In this section, wander through travel itineraries and themed visits. Let yourself be transported into the very heart of the Montréal experience! Double-Decker City! When in Montréal, look down and you’ll see double. That’s because this is really two cities in one. Above ground is the largest concentration of stores in the country, underneath lie miles of commercial space; every nook and cranny filled with more shops and boutiques. Montréal offers phenomenal shopping from serious chic to unique gifts, not to mention a host of services such as soothing spa treatments. Browsing or buying, you’ll discover great shops all over the city… and even underneath it! Venture out into streets lined with Victorian boutiques, antique shops or a whole underground network of commercial centres. From downtown chic to Old Montréal charm, the incredible choice is yours. From award-winning restaurants to ethnic food stores to locally grown products, Montréal is a city oozing with a thousand flavours. Discover everyone and everything behind the cuisine that’s melted the hearts of food lovers far and wide. Just take your pick – our palate-pleasing and informative tours are designed to suit every epicurean’s tastes (by woolgar at testsforge). Dining in Montréal promises to be a memorable part of your trip. Satisfy your craving for great food, Montréal-style. Visit www.tourism-montreal.org for more details. The weather in Montréal varies from -8.9°C (16°F) to 22.3°C (72.1°F) depending on the season, so visitors are encouraged to check the forecast before packing. The Canadian currency is the Canadian dollar. Foreign currency and traveler’s cheques can be converted into Canadian dollars at foreign exchange banks and other authorized money exchangers. Credit cards such as VISA, MasterCard and American Express are widely accepted. We suggest you have some Canadian funds before travelling to Canada. In bars and restaurants, it is very rare that gratuities are included in the bill. In general people are expected to leave 15% of the bill to the waiter, and 10-15% to a taxi driver or tour guide. For porters or other hotel employees the average tip is $2.00. If the customer is paying with his card, they will either have to write down the amount they are leaving or will be able to choose it on the machine. The standard electrical supply is 110 volts (60Hz). Please note that emergency(911), directory assistance(411) and international directory assistance(1+area code+555 1212) phone calls are free from pay phones. On the Island of Montreal, 514 is the area code and in off-island suburbs it is 450. Participants are advised to get adequate travel and health insurance before leaving their respective countries.